McDONALD, Joseph Ewing, a Representative and a Senator from Indiana; born in Butler County, Ohio, August 29, 1819; moved with his mother to Montgomery County, Ind., in 1826; apprenticed to the saddlers trade when twelve years of age in La Fayette, Ind. ; attended Wabash College, Crawfordsville, Ind., and graduated from Asbury (now De Pauw) University, Greencastle, Ind., in 1840; studied law in La Fayette, Ind. 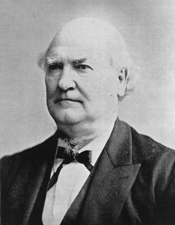 ; admitted to the bar in 1843, and practiced; prosecuting attorney 1843-1847; moved to Crawfordsville, Ind., in 1847, where he practiced law until 1859; elected as a Democrat to the Thirty-first Congress (March 4, 1849-March 3, 1851); was not a candidate for renomination in 1850; elected attorney general of Indiana in 1856 and was reelected in 1858; moved to Indianapolis in 1859; unsuccessful Democratic candidate for Governor of Indiana in 1864; elected as a Democrat to the United States Senate and served from March 4, 1875, to March 3, 1881; unsuccessful candidate for reelection; chairman, Committee on Public Lands (Forty-sixth Congress); died in Indianapolis, Ind., June 21, 1891; interment in Crown Hill Cemetery.